Hi Margot. I want to thank you for stopping by the Giorgio Armani counter, it was such a pleasure meeting you. 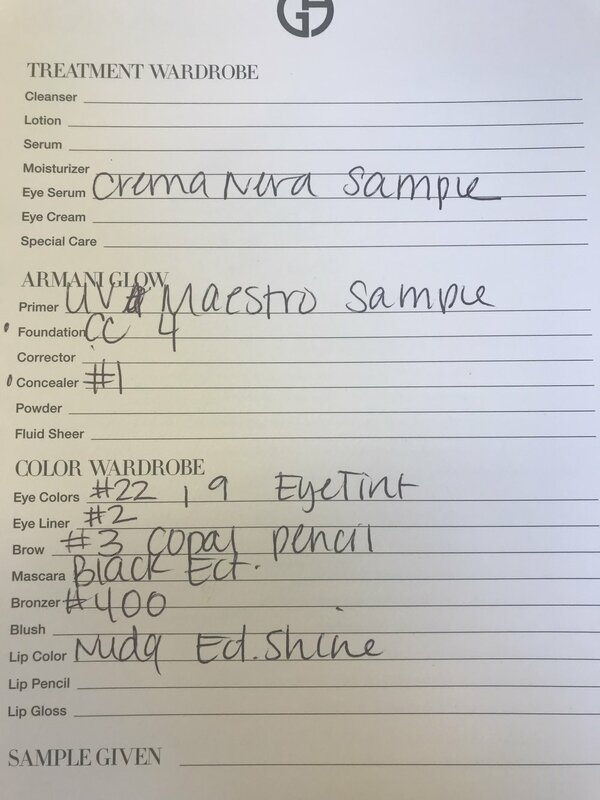 As promised, here is a quick guide to help you with your new Armani products! I hope this tool helps and of course, please let me know if you have any questions. Apply your skincare as usual, please allow at least 10 minutes before putting on any face makeup. This gives your skincare enough time to properly absorb into the skin. Bronzer :: Using large powder brush, lightly apply to face in the shape of a "3" and "E". The secret is to good bronzer is building the coverage. Use video below as a guide on application. Here is a list of the items we used today! I hope this help you! Please feel free to reach out with any questions or if you would like to learn anything else. Don't forget to check out the rest of my site, it has tons of useful information!